So of course my daughter wouldn't want any kind of typical theme for her second birthday party. Kids don't like to make it easy for us parents. 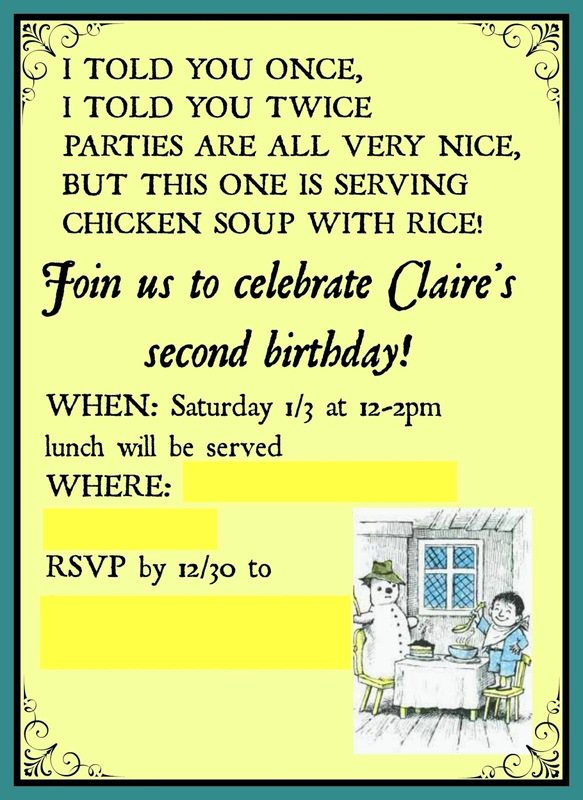 I thought long and hard about a theme and really, one of the things she has been most interested in over the past 6 months or so has been the book Chicken Soup with Rice by Maurice Sendak. It's a really cute book and one of my favorites when I was a kid. I've even had it memorized for quite a while now. Each page is about a different month of the year. 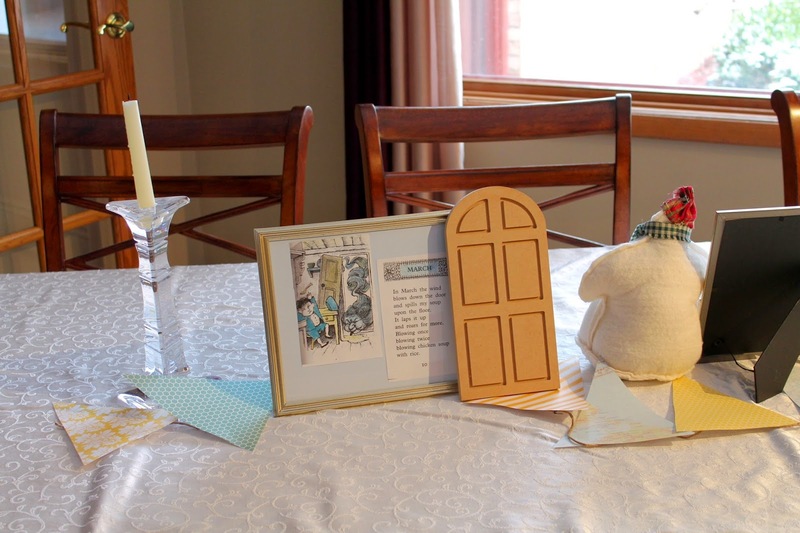 I made her invitation using picmonkey adding overlays, framing, and pictures to emulate the book. We just printed them up as 5x7 photocards at Walmart for about $25. So how do you plan a party around a book? For this book I took my menu, decorations, and color theme from it. All the illustrations are done in yellow and a light blue. 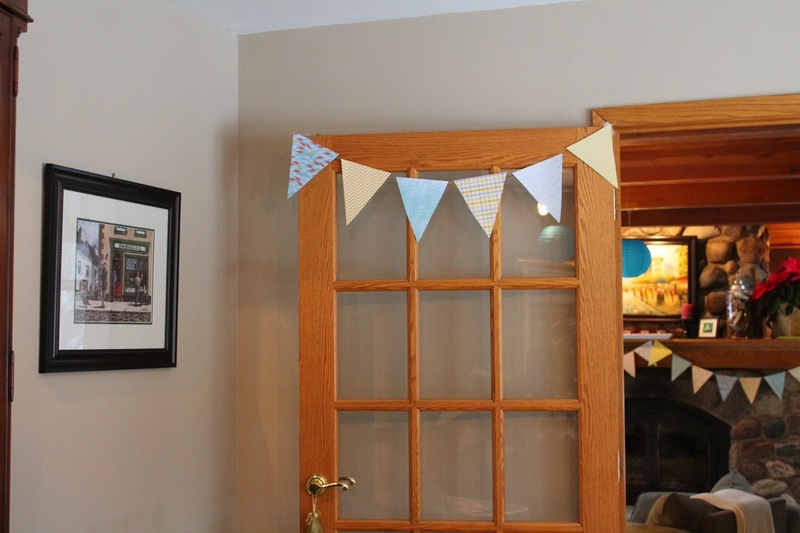 I bought 12 pieces of 12x12 inch scrapbook paper in the colors and used this template to make bunting for all over the house. I just taped the pieces onto twine and didn't hole punch them though-less time=better! We have four wooden beams that span our living room. 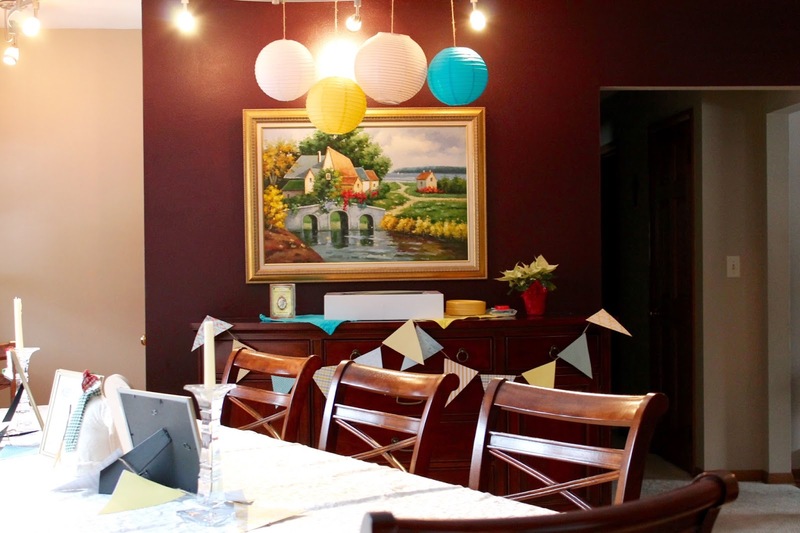 We purchased white, light blue, and yellow paper lanterns to hang up on the beams and light fixture in the dining room. Paper lanterns are cheap and unlike tissue balls, fold down flat, and are easily reused! I use them for almost every party I throw. To complete the decorations I use our printer/copier to copy each page of the book. We bought frames at the dollar store and I framed each month with a background. 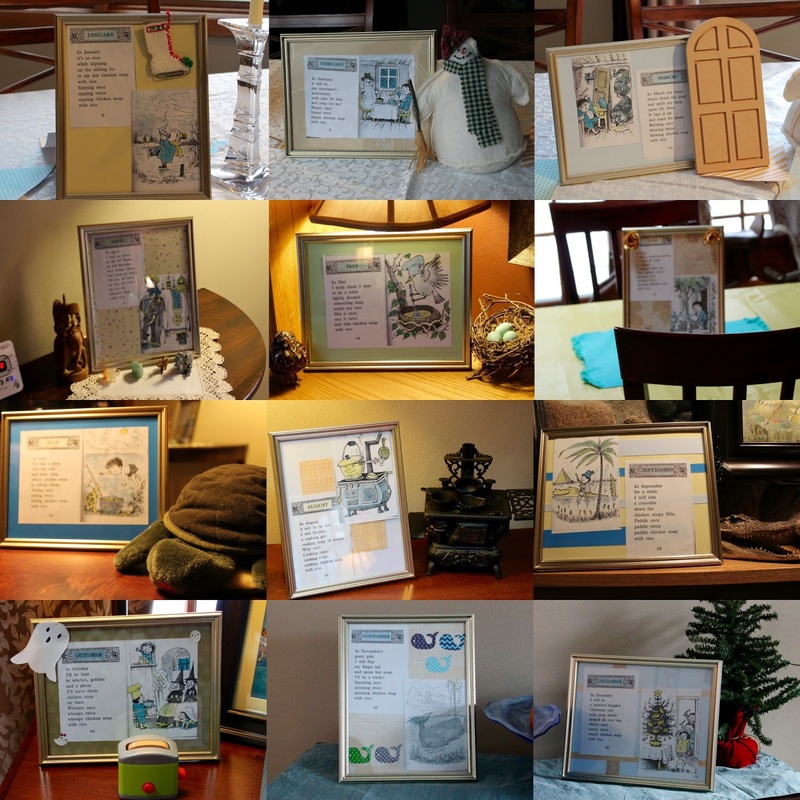 I collected items that went with the poem for each month to place by the frame. 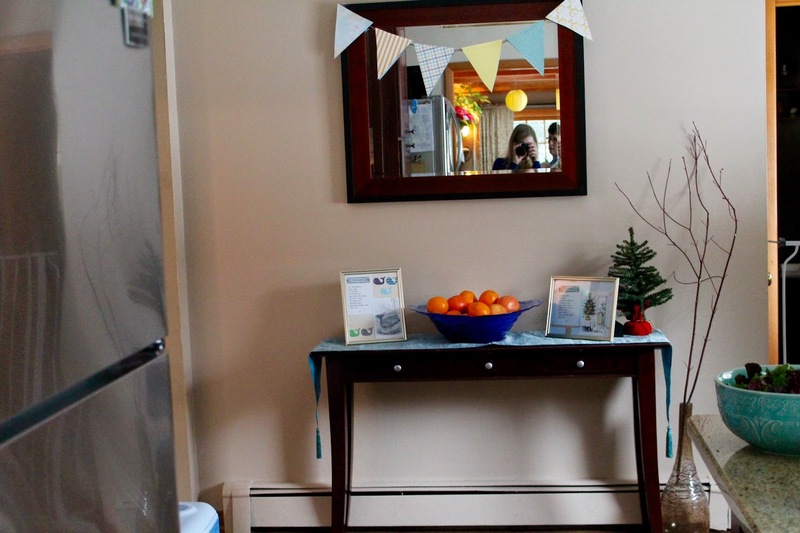 Easy, cheap, and completely adorable! It also helped for people who weren't familiar with the book. So based on the title of the book, choosing what to serve was fairly obvious. I found this super easy chicken with wild rice soup crockpot recipe to make (spoiler it was delicious). However I wanted some other options. So I made a chicken and rice casserole and chicken and rice meatballs. The only problem is that the meatball recipe does not include a bake temperature. We tried 400 for at least 15 minutes and it seemed to do the trick. They were perfect to make ahead of time, stick in a crockpot and serve with gravy! Between her birthday and Christmas, Claire has become very good at opening presents! Cake is more fun to play with than eat apparently. We cleaned her up once she started saying the frosting was lotion and rubbing it on her hands and arms! 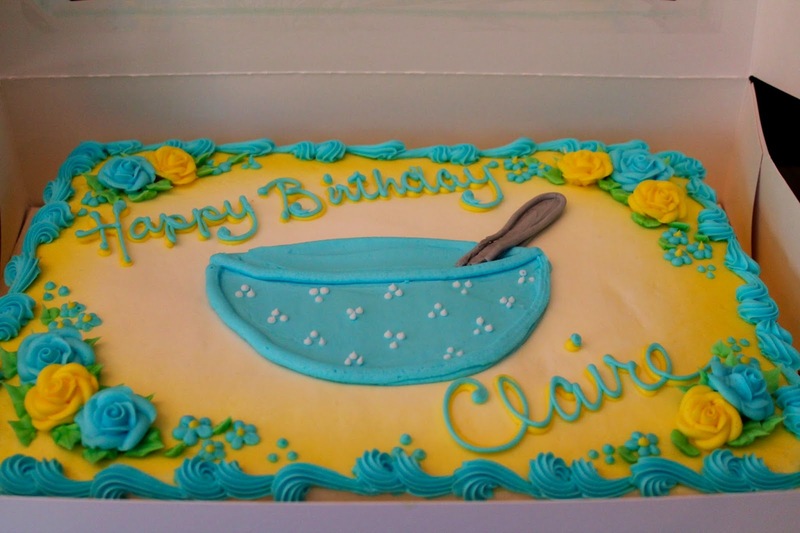 This was such a fun theme to plan for and Claire really loved it. She kept walking around at everything and saying, "Chicken rice!" which is what she calls the book. I can't wait to see what she is going to be interested in next year! Your baby girl is beautiful and OMG her hair has gotten so long. I absolutely love her party and the theme. Never heard of that book but I am interested to own it now. 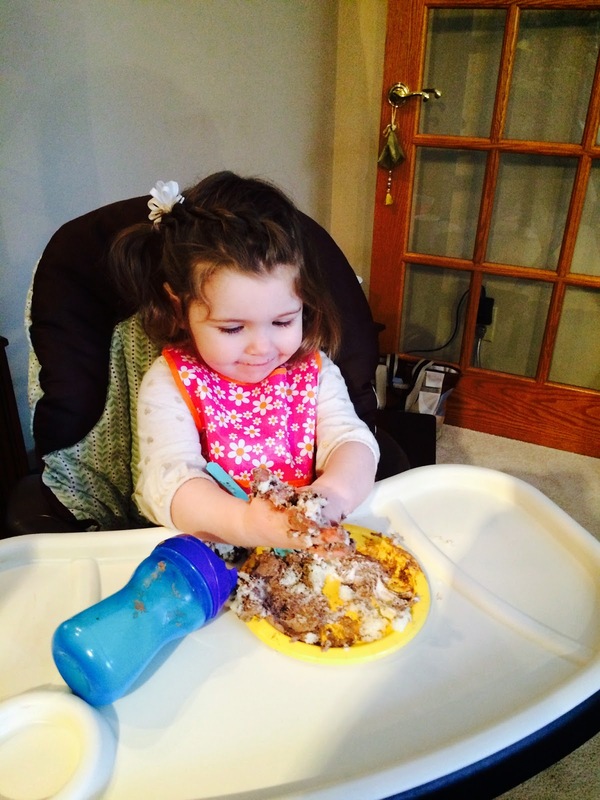 I am currently planning Vivian's little 2-year party also. How did your baby girls grow up so fast? 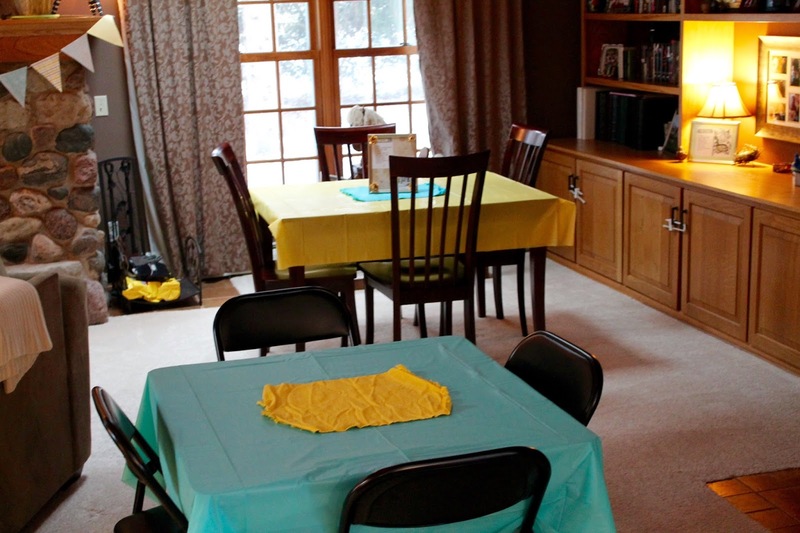 How fun and what a cute theme for a party! I love all of your decorations and the food sounds delicious! Claire looks adorable! hehe that is such a creative party idea! love that book, too. That is an adorable theme! Omgsh what a great theme--you did such an amazing job :) Claire looks like she def. enjoyed herself! Happy birthday to your sweet girl! 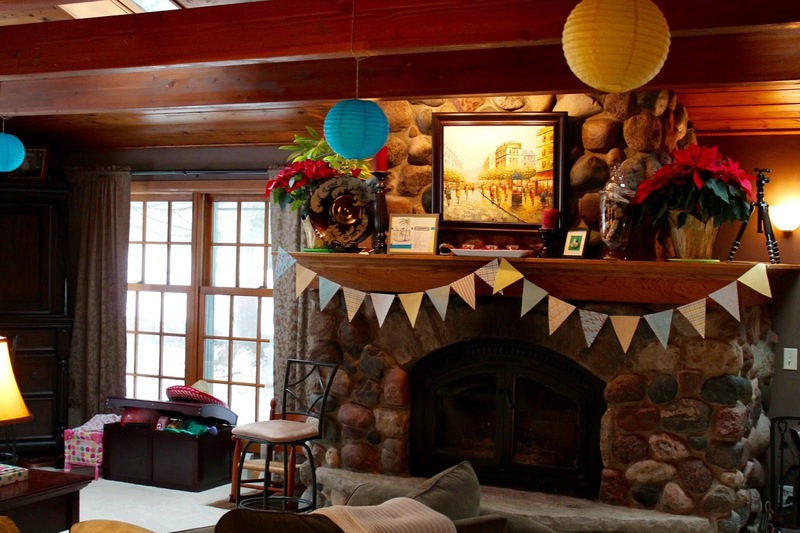 You did such a great job on her party :) On a side note, your living room is totally beautiful, love the stone fireplace! your daughter is adorable. Looks like she had a great party. This is SO adorable and so creative! And your daughter is such a cutie! Love your mantle! Happy birthday to your little girl! What a wonderful day! Yay, great pictures, glad you captured the lotion picture and can't wait to make your recipes, my family loved them! Awesome party, not that I ever had any doubt! Laura this looks like so much fun! What a great party with such a fun and unique theme. You are clearly such a great mom. 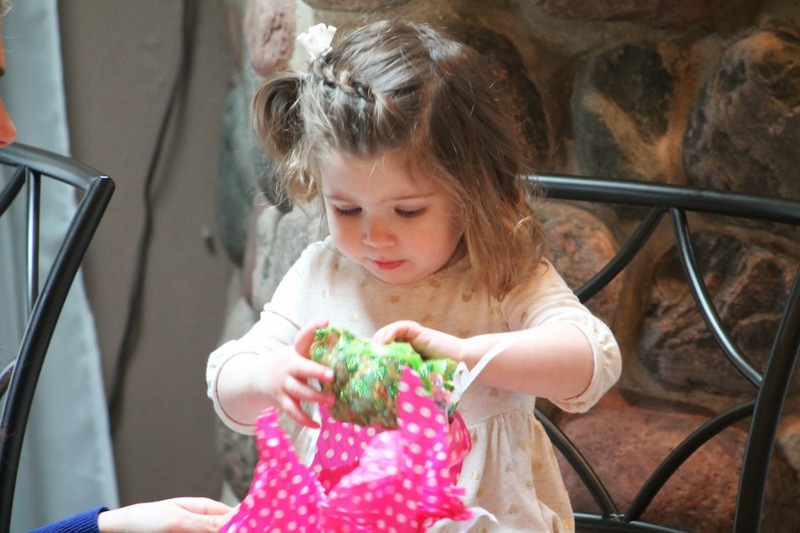 Aww she is so cute, you have a beautiful daughter! 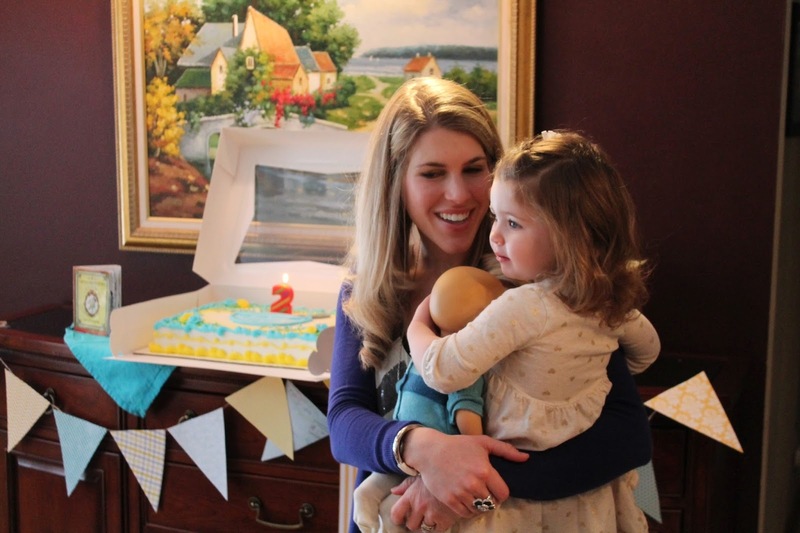 This is an adorable birthday party idea, Laura! I used to love that book when I was little - I remember our first grade class rewriting a version of the book maaaany long years ago :) Claire is such a beautiful little girl - she looks so grown up!